In the Family Tech column that ran in the September 18, 2014 printed edition of Prince William Today, I discuss how a business, and individuals, receive the most cachet with an email address that is to their own domain. I talked about creating your own domain, and setting up your email to be sent to that domain in another blog post today. Once you have your own domain, a small business should definitely set up its own web page. It doesn't have to be much. Think of it as your business card online, where people can find it via Google or Bing search. And it provides a simple link your satisfied customers can share with their friends via email, Facebook, Twitter etc. You'll want the business's name, a brief sales pitch, address, phone numbers, and email addresses on it. The sales pitch can be as simple as a list of services. If a restaurant, you'll want the menu at the very least. A few testimonials, and a map can't hurt. Here is a website I had a hand in creating for my local Chinese Restaurant, House of Chou. I used SquareSpace.com. It has just the basics a take out restaurant needs: phone number, menu, map for pickup, and interior photos. The easiest way to setup a website is to use a hosting service that has easy tools for designing your own website, and then hosts the site for you. I've used SquareSpace.com, but there is also wix.com and others. All three have templates to help begin your website with, and lots of online help. SquareSpace gives you free creation and hosting for two weeks. They do not even ask for a credit card number until the two weeks are about up. Wix is free forever, but they place large ads on your page. Pricing runs about $8 to $25 a month, depending on service and features. Neither offers email hosting, so you'll need to obtain that elsewhere if you want to. The other blog post has details about email only hosting sites. Use the hosting sites template to create your website. Check out websites for people in similar business for ideas. Look at award winning websites for ideas. Once it is looking good, you can publish it for the world to see. In time, the search engines, like Google and Bing, will see it too, and your site should show up in search results. Joe's Plumber won't be on the front page for the query "plumbers", but hopefully will show up in the first few pages for "plumbers woodbridge virginia". Individuals benefit too from having a personal calling card online. It helps people to find you for business reasons, and gives you a central place to host a blog, photos, and professional publications. While it is always good to have an online presence in places like Facebook for personal reasons, or LinkedIn for professional, it is best to have your own place on the web. That does not mean you have to create your own website. A very basic business card type site can be setup for free at About.me. See my About.me entry as an example. If I paid for their service, I could have my own domain markstout.info linked to it. Instead I'm creating my own personal web page now at my own hosting site. On the actual website, clicking the links brings up more information. The photo has little to do with me, except that I took it and find it interesting. I've set up my site so I can change the photo from time to time. I could create a personal website like this using SquareSpace or Wix as mentioned above. In reality, I'm hand coding mine so I can learn. No one has to do it that way. There are some great examples of personal web sites out there for inspiration. Start building your business, or personal brand, online. 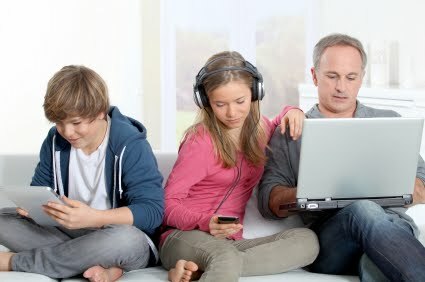 Be sure to check future Family Tech columns, and this blog for other discussions on this topic. And if you use this information to setup your own web page, please tell us in the comments. Thanks for the excellent article. I too have created a personal web page and a web page for my small business after reading this article. I got best hosting deals for my websites from TheWebPole.com at low cost with 24/7 customer support. I am satisfied with their services.